What are the Best US Ice Cream Shops? 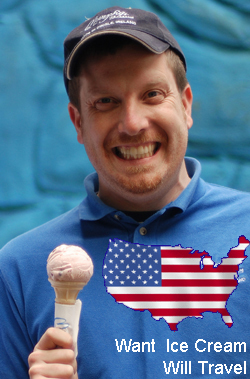 My brother Sean wants to head over the the US to visit ice cream shops, and he would love your suggestions as to which ice cream shops he should visit. He will definitely be going to New York, so suggestions in the New York area especially welcome, but where else should he go? What are the unmissable US ice cream shops at the moment? Please leave comments with your suggestions! 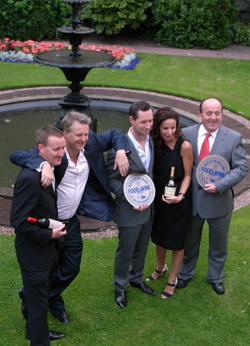 I’m delighted to announce that Murphys Ice Cream has won Artisan Producer of the Year from Food and Wine Magazine. Thank you to our whole team! Blazing Salads Bakery and Gubbeen Smoke House were highly commended and commended, and I congratulate both of them and encourage you to seek them out. For your information, Chapter One won Restaurant of the Year, and Sunal Ghai won Chef of the Year. 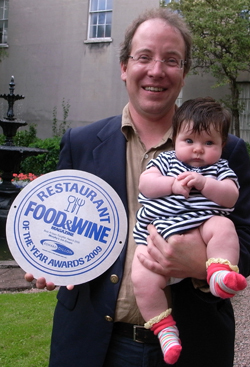 The Tannery won best of Munster, and the Park Hotel was entered into the Food and Wine Hall of Fame. The full list is in this month’s Food and Wine Magazine. Inside, you’ll also find a great list of artisan producers and farmer’s markets. There aren’t too many fruits that seem to grow well in our damp climate, at least not in the garden of someone as horticulturally-challenged as myself. 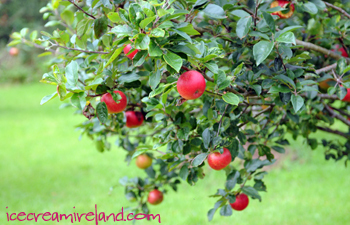 However, I do have some wonderful apple trees in the back of the house, and the apples this year are big and full of flavour. So far, we have just been eating them, but I think I may turn some of them into ice cream – perhaps an apple brandy or blackberry and apple flavour that we can serve in the shops for the autumn. 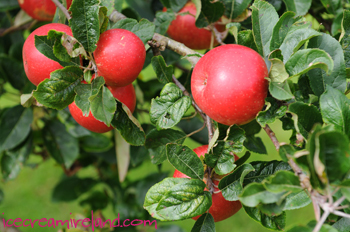 The birds around the place are quite happy at the moment to be sharing in the bounty, so I’d better get picking soon! Dingle is a very small town (only 1800 people), and yet it is amazing how many things go on here. Of course there is a huge influx of tourists in the summer, but that doesn’t fully explain it. 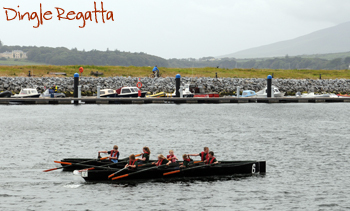 Last Saturday, for example, we had the Dingle Regatta, La Solitaire Figaro, and the Tour de Munster all at the same time. 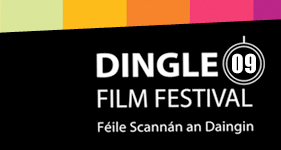 Today, I was looking through the website for the Dingle Film Festival. It promises to be great fun, with a wide range of films and industry luminaries such as Ned Dowd, Marc Flanagan, Pearse Elliot (Man About Dog), etc, arriving into town. If that wasn’t enough, it’s the same weekend as the Dingle Marathon. One would have thought that it would have been a better idea to put the two events on different weekends, but I guess that wasn’t possible. I like to think I’m quite adventuresome in the kitchen. However, with certain foods I’m an absolute traditionalist, and tiramisù is one of them. Italian for “pick me up” or “pull me up,” there are some who say the dessert originated in Sienna and others who claim it’s a relatively recent invention from Treviso, near Venice. In any case, it’s the one dessert that so regularly disappoints me at restaurants that I have stopped ordering it unless I am absolutely certain they will do it right. For me, tiramisù must have mascarpone, and it must have egg yolks (unlike Gordon Ramsey’s and Jamie Oliver’s versions – although from a catering standpoint I can understand why they don’t want the risks associated with raw eggs). I don’t want it with orange flavouring or variations of the alcohol (Marsala wine). 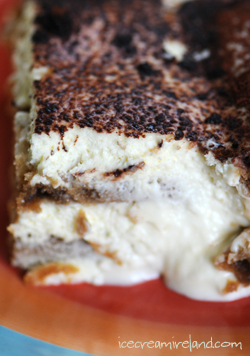 I guess you could say I want my tiramisù the way my grandmother used to serve it up at her house in the Ticino. I pressed her for a recipe shortly before she died, but she confessed that she didn’t actually make it herself and had brought it in on the sly each time we begged her for more. I never found out her source. 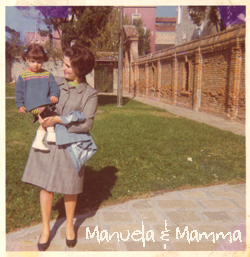 However, my partner Manuela, who is from Venice, recently managed to retrieve her mother’s tiramisù recipe. We made it at home last night, and it came out just about perfect in my eyes. Best of all, once you have the right ingredients, it’s quiet easy and quick to make. If you wish to try it, the recipe is below. I’ll call it Tiramisù della Mamma in honour of Manuela’s mother. Please note that this recipe does contain raw egg yolks, so it’s not suitable for pregnant women, and I would suggest you use fresh, local organic or free range eggs from a source you trust. 1. Beat 80 grams of the sugar and the egg yolks together. 2. Add the mascarpone and 1 teaspoon Marsala wine and mix until smooth. 3. Whip the cream until you have soft peaks. 4. Fold into the mascarpone/egg mixture. 5. Add the remaining 2 tablespoons of sugar to the espresso and stir until dissolved. 6. Add the remaining Marsala wine and transfer to a shallow dish. 7. Dip the savoiardi (lady fingers) into the Marsala/espresso mixture for about 5 seconds. 8. Put a layer of the dipped savoiardi into a round bowl (traditional in the Veneto). 9. 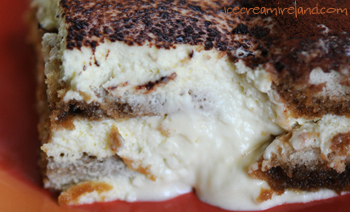 Add a layer of the mascarpone/cream custard. 10. Add another layer of of the savoiardi, then the remaining custard. 11. Coat the top with dusted cocoa. 12. Refrigerate for at least four hours and preferably over night. 13. Bring out at least half an hour before serving to so it’s not served at a chilled temperature. 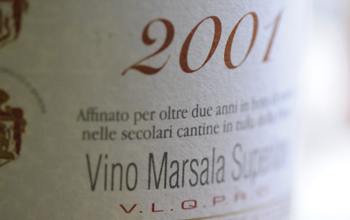 Since Marsala wines and espressos vary so much in taste, it might take a bit of tinkering for you to get the balance right between the coffee and Marsala. It’s part of the fun! Ever the last couple weeks, there have been a few interesting articles on ice cream. 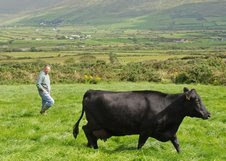 Click here for Ollie Moore’s piece, that appeared in the Examiner, about ice cream, cows and Murphys! There was also an article in last Sunday’s Tribune, which talks about ice cream in Ireland, with thoughts from my brother Sean – click here. Finally, the Independent had a great article on the 10 best beaches for food lovers, and we’re delighted Ventry (and ourselves) made the list! Click here.